← Workshops, Conferences and Unconferences OH MY! 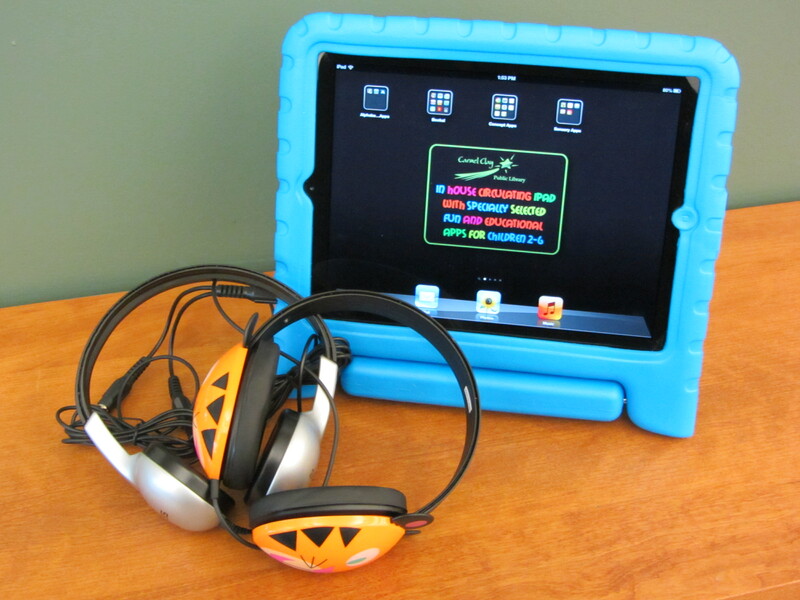 Our children’s department recently acquired five new iPads, and in March we began making them available for caregivers with young children for use within the library. A committee of children’s librarians has chosen the apps, with help from LittleeLit.com and others. To introduce this new resource to our patrons, we offered our first iPad storytime on February 19, which we called An Appy, Jammy Storytime: Preschool Tales with the iPad. Our foray into the iPad world, therefore, has two parts – the in-house, circulating iPad part, which launched March 1, and the iPad programming part. This post focuses on programming. Let me say right here that we are really, really lucky to have a big staff, which meant that two of us could present this program–if you are new to iPads, and you can afford to have two presenters for your trial run, we highly recommend it! Until you’ve had a lot of experience with tablets, it’s nice to have one person reading/singing/goofing around while the other person handles the iPad. And let me also say that Holly is the middle-aged half of this team, and Elizabeth is the Millennial. Guess which one really appreciated having a tech-savvy partner to help with the iPad? And guess which one could have easily managed to do this storytime on her own, practically in her sleep? We also have the luxury of being able to mirror our iPads wirelessly through our projector using AirPlay (AppleTV). 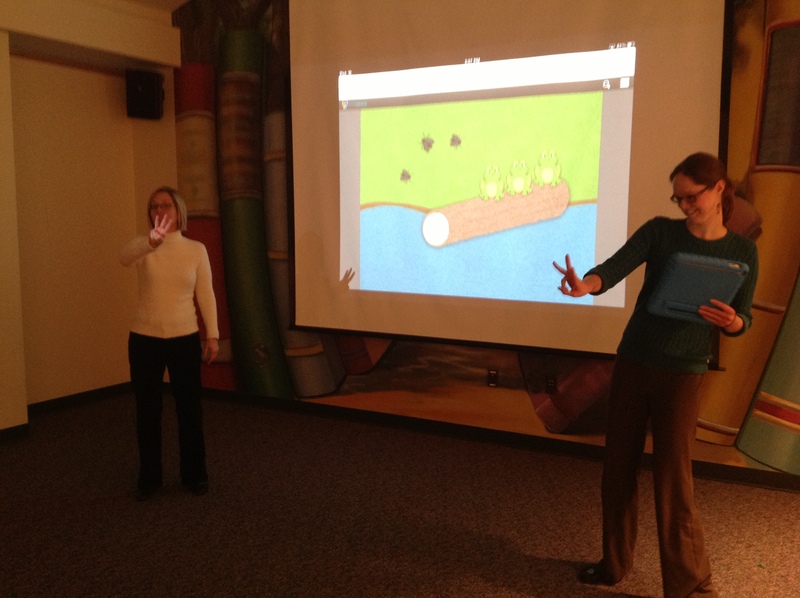 So we were able to show whatever was on our iPad on the projector screen as well as feed the sound through the speakers. This is a new feature for us (Apple TVs are not as expensive as one may think- less than $100), but it did take some fiddling to get it to work with our network. It was worth it, however, because it meant that we could lead the storytime from the front of the room using the projector screen as our backdrop and the iPad as a remote control. Put on your jammies and come on over to the library to join us for an evening storytime full of the usual stories, songs, and activities – but with a modern twist as we include eBooks, apps, and other educational iPad elements. Come for fun and new ideas. This program will be held in the Storytime Room and is for children ages 3-5 and their caregivers. We chose to jump in all the way and offer this storytime almost completely on the iPad. The structure and activities chosen are similar to our usual storytimes, but all of the stories and songs were on the iPad. Welcome: Introduce librarians, mention circulating iPad program to come soon, briefly explain app organization and use with young children. Book app: Moo Baa La-La-La! by Sandra Boynton. We turned off narration and read the book aloud, tapping and swiping the animals so kids could moo and baa and bark along with them. Book-based app: Don’t Let the Pigeon Run This App! Very interactive–if you haven’t seen it, this is quite popular with kids of all ages. The kids help pick elements of the story and also participate by shouting “No!” to Pigeon’s pleas. Action rhyme: Five Green and Speckled Frogs. We had uploaded the song on iTunes from a CD called Five Little Monkeys. We also used Cen’s “Five Green and Speckled Frogs” slideshow projected on the screen, which Elizabeth tapped while Holly led the kids in singing and acting like frogs. Ebook: Little Hoot by Amy Krouse Rosenthal. We showed how to access Tumblebooks on the iPad from our library’s website, then showed the ebook on the screen. We picked a short and briskly-read story. Song: “Morning Bells are Ringing,” using the free Songs4Kids app to play the song while the words were projected on the screen. Before running the app, we handed out bells to all the children; we played the song twice, first letting the kids ring the bells throughout, and then having them hold their bells still until we got to the “Morning bells are ringing, ding, dang, dong!” part. This app highlights the words as they are sung, which is great, of course, for early literacy. There are two Songs4Kids apps, both free, and each contains numerous songs and rhymes. Goodbye song: “Wave Goodbye” by Rob Reid, with words projected on screen. While our library hasn’t had much success with evening storytimes in the past, we thought this one was different enough that it might be worth a try. As luck would have it, this was a really cold, snowy day, so that may have kept some people home; we ended up with six children and six adults. 1. How old is/are the child(ren) who attended? 2. Do you have an iPad at home? 3. What did you like best about this storytime? Great resources for kids. Interactive, educational–just great. Everything, I just may buy an iPad! The interaction with the kids–it seemed to really engage them by seeing the action on the screen and interacting during certain parts. 4. What needs improvement or what did you not like? This was a great introduction to the technology. 5. Would you come to an app-based program again? Is so or if not, why? Yes–just another way to get my kids interested in reading. Yes, my daughter loved it. 6. Do you think you will check out an iPad from our circulating program in the future? We would love to come to future storytimes like this again! Very enjoyable. Maybe a set activity for the kids to try on the iPad after class is over–just for a couple of minutes. Thanks! It was great! To sum up: The technology really felt like it facilitated the traditional elements of a storytime and expanded our options. Judging by this admittedly small sample, I’m guessing we’re going to be offering more of these programs in the future, and will need to order lots more iPads very soon to meet the demand! Posted on March 13, 2013, in Apps, Story Time and tagged CCPL. Bookmark the permalink. 8 Comments. Thank you for sharing such a detailed description of the program. Thank you for sharing. I have a question about using Apple TV. The Apple site says that the app has to be AirPlay-enabled. Do you find that the apps you want to use are AirPlay-enabled? I have never had a problem with apps not mirroring from the iPad, except for the very cranky bear, which likes to be upside-down sometimes.